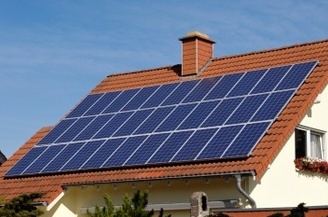 Solar PV turns the light energy from the sun into electrical energy. This energy can then be used to run the appliances within your home. Solar PV can even generate electricity on a cloudy day. 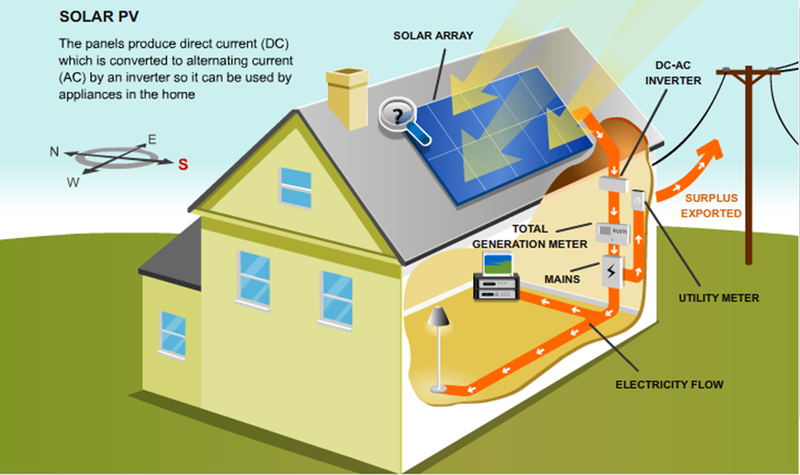 The solar panels generate electricity as Direct Current (DC). This is then converted into Alternating Current (AC) using an inverter. This in turn is connected to your consumer unit (fuse box) where it is able to supply electric to yourself, or for export to the grid. Domestic systems are designed to fit on households, and generate upto 4kW of electricity. • Ensure that your site is suitable for a Solar PV system. • Ensure that the electrical installation is up to date and meets with current safety regulations. • Obtain the required information to predict the amount of power that will be generated. Once you are happy with the quotation and have obtained planning permission (if required) you can place your order for your PV system. If required, we will arrange for scaffolding to be in place prior to the installation of your PV system onto a roof and removed afterwards. Installation usually takes no longer than a couple of days and once completed you can start enjoying the benefits of Solar PV. We will assist you to complete the Feed-in Tariff application process to ensure that you get the payments promptly.